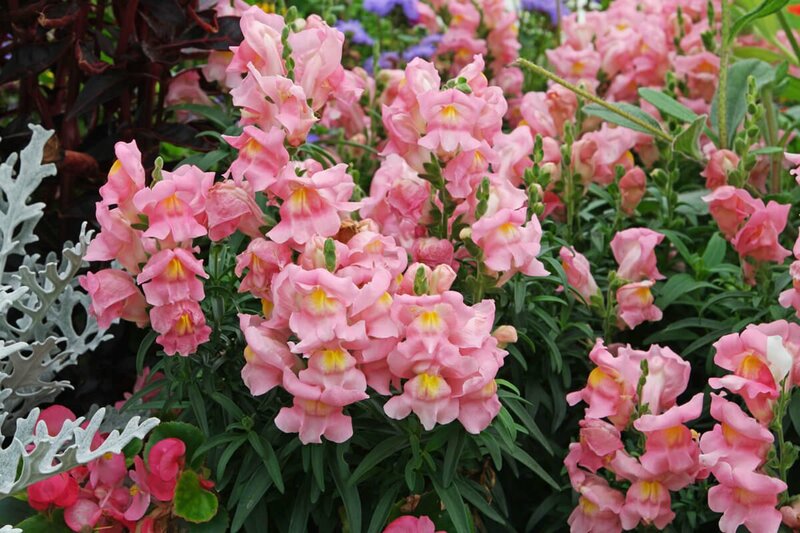 Snapdragon (Antirrhinum majus)is an ornamental, herbaceous perennial, flowering plant. It can grow up to 0.5 – 1 m tall, rarely up to 2 m. It has spirally arranged, glossy, lance shaped, dark green leaves. The flowers are produced on a tall spike, each flower is 3.5 – 4.5 cm long, zygomorphic, with two ‘lips’ closing the corolla tube, wild plants have pink to purple flowers, often with yellow, white lips. The common name “snapdragon”, originates from the flowers’ reaction to having their throats squeezed, which causes the “mouth” of the flower to snap open like a dragon’s mouth. It thrives best in full sun to partial shade. It is easily grown in moist, organically rich, well-drained soils. Snapdragons like a neutral soil pH, between 6.2 and 7.0. Water thoroughly and often to keep potting mix constantly moist. Use a pot with a drainage hole to prevent root rot. It prefers cool to moderate temperatures 60°F – 75°F / 16°C – 24°C. If you choose to grow them outdoors, it’s a good idea to harden off the seedlings before moving them outside in early spring. Snapdragons will tolerate light frost. It requires average room humidity around 40% relative humidity. Fertilize every two weeks with a balanced liquid fertilizer diluted by half. It can be propagated by seeds. Sow snapdragon seeds indoors 6 weeks before last frost date if transferring them outdoors. Use a sterile seed starting mix, barely covering seeds. Keep medium moist, but not soggy at 65°F-70°F/18°C – 21°C. You can expect to see seedlings poking up in about 10-12 days. There is no serious pest or disease problems. It is susceptible to mold, fungal leaf spots, downy mildew, wilt and root rots. Watch for mealybugs and aphids.